Irena's Vow is a serious story with real tales of terror, horror and apprehension. If only the play had told the story that way. Written by Dan Gordon, it tells the story of Irena Gut Opdyke, a Polish-Catholic nurse played with earnestness by the talented Tovah Feldshuh(Golda's Balcony, Yentl). While a member of a Polish underground unit Irena was caught by invading Russians and ultimately raped, beaten and forced to work in a medical unit. Later, as a slave laborer running a laundry room with Jewish workers she is reassigned to a conflicted SS major, played by Thomas Ryan, as his housekeeper and major domo. As she is preparing to leave her current assignment she overhears a conversation wherein she learns that the Nazi's plan is that by July 21st there will be no more Jews alive in the region. She witnesses this first-hand when forced out of a store to watch as the Nazi's carry out their plan, lining up Jews in front of a pit and shooting them into it. Irena returns to her employees in the laundry intent on hatching a plan to save them from certain death. Her ultimate solution is to hide them in the house of her new employer, Major Rugemer. This works out fine until the Major comes home to find two of the Jewish women helping Irena dust the house. He promises to keep her secret if she will become his mistress. Irena's Vow is a tidy little play. Therein lies its problem. The subject matter deserves much better treatment than it gets, more respectful treatment, more attentive treatment. This is the equivalent of doing "Schindler's List" as a dramedy. We only ever meet three of the 12 Jews that Irena ultimately hid in the Major's basement. The characters we meet are chosen very specifically to be included. 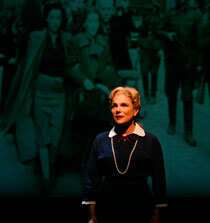 We will not, however, learn this until a post-show talk-back with Irena Gut Opdyke's daughter, Janina Opdkye Smith. One of the two Jewish women, Ida Haller, played by Maja C. Wampuszyc, becomes pregnant only to decide to abort the baby. After much discussion Irena convinces her to not abort the baby. During parties at the house, after the baby was born they would hide it in a secret passage that leads under the floorboards of the gazebo in the yard. In her talk-back Ms. Smith tells a touching story of how this family would later learn that after being shunned by his community as a Jewish sympathizer, Major Rugemer ends up homeless and living on the street. This couple who he had begrudgingly hidden all those years ago now invited him to live with them. That child born in the basement of his house would later grow up to call the Major, grandpa. We would never have known this part of the story had the production not had this talk-back after the show. In this instance, instead of rushing through this story in 90 minutes the author should have taken a lesson from other authors whose plays actually necessitate two or three performances to tell their story. I am by no means suggesting that the author do that, I am telling him to slow down and take his time. The story certainly could have supported it. Ms. Feldshuh has the audience eating out of her hands almost immediately and has a good many of them crying by the end of it. Director Michael Parva directs a seamless production as we watch Ms. Feldshuh move from a 20-year old Irena to Irena in her later years. Unfortunately, with an abundance of comedic throw-away lines, sparsely drawn characters, and a contrived theatrical device as a framework this play isn't what it could or should have been. See detailed show credits from IBDB.com.
" Everyone who goes to the theatre has a right to his own opinion, but he doesn't have a right to have it taken seriously. "